to control the pattern of store releases. Other units preselect the desired arming of bomb fuzes. Each serves a definite purpose in accurately delivering weapons against the enemy. The Navy uses a wide variety of suspension equipment. Suspension equipment is designed to accommodate a certain maximum weight. The structural strength of the aircraft determines the maximum weight that may be suspended. The aircraft weight capacity per rack is usually less than rack design capability. Several representative types of suspension and releasing equipment are discussed briefly in the following text. BOMB RACKS Aircraft bombs, torpedoes, mines, and other stores are suspended either internally or externally by bomb racks. Bomb racks carry, arm, and release these stores. The BRU-14 (series) bomb rack (fig. 8-31) suspends and releases conventional and nuclear weapons/stores weighing up to 2,200 pounds with a 14-inch suspension. In certain applications, adapter assemblies are added to increase the suspension capacity to 30 inches. When a weapon/store is loaded onto the bomb rack, the suspension lugs on the weapon/store engage the heel of the bomb rack suspension hooks. This causes the hooks to pivot up and engage the suspension lugs. The hooks are held in the closed position by sears. When the pilot initiates bomb release, an electrical signal is routed through the weapon system circuits to the bomb rack. This signal activates a solenoid that activates the release linkage in the bomb rack. This causes the suspension hooks to open, letting the weapon/store fall away from the aircraft. The BRU-14 has a CAD backup release method if the primary method fails. When the CAD is fired, the release linkage frees the weapon/store. BOMB EJECTOR RACKS Bomb ejector racks differ from standard bomb racks. Ejection racks use electrically fired impulse cartridges to open the suspension hook linkage and eject the weapon/store. When in flight, a vacuum can be created under the fuselage and wings of the aircraft. In some cases, this vacuum will prevent the released weapon/store from entering the airstream and falling to the target. Physical contact between the weapon/store and the aircraft structure may result. This could cause damage to or loss of the aircraft. Bomb ejector racks eject the weapon/store from the bomb rack with sufficient force to overcome this vacuum and ensure a safe release. 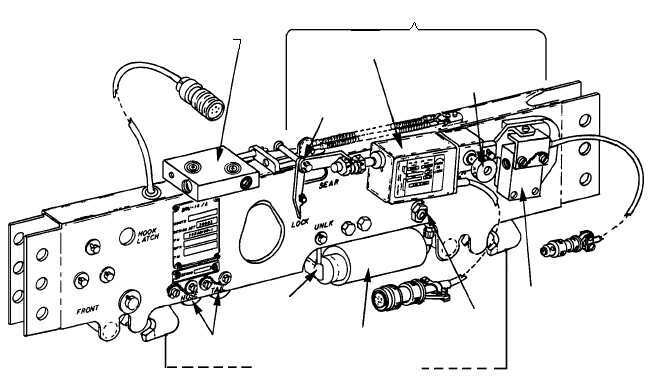 8-25 ARMING UNITS BELLCRANK LINEAR ELECTRO-MECHNICAL ACTUATOR (LEMA) COCKING KNOB AUXILIARY UNLOCK ASSEMBLY (IFOBRL) IN-FLIGHT OPERABLE BOMB RACK LOCK (IFOBRL) ELECTROMECHANICAL ACTUATOR (IFOBRL) MANUAL ACTIVATION KNOB (IFOBRL) LOCKBAR (IFOBRL) SECONDARY RELEASE ASSEMBLY STORE SUSPENSION HOOKS ANF0831 Figure 8-31.BRU-14 (series) aircraft bomb rack.